I first learned that “Marine Mammal Observer” was a legitimate career field during the summer after my junior year at the University of Washington. 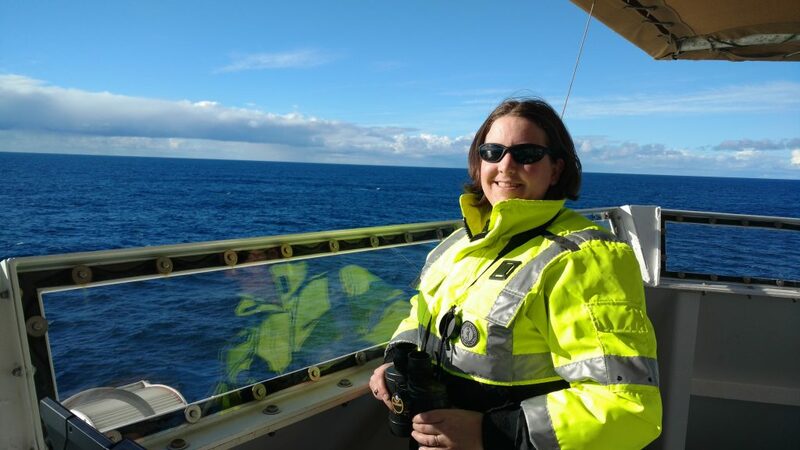 I had the good fortune to volunteer for the BASIS fisheries-oceanography survey onboard the R/V Oscar Dyson where I met two wonderful bird observers who taught me how to identify various pelagic bird species and clued me in to just how diverse the marine science job market can be. After the cruise, younger Florence went off with an expanded world view and a small dream that maybe someday she could go out to sea and survey for marine mammals on a regular basis (and get paid for it?!). 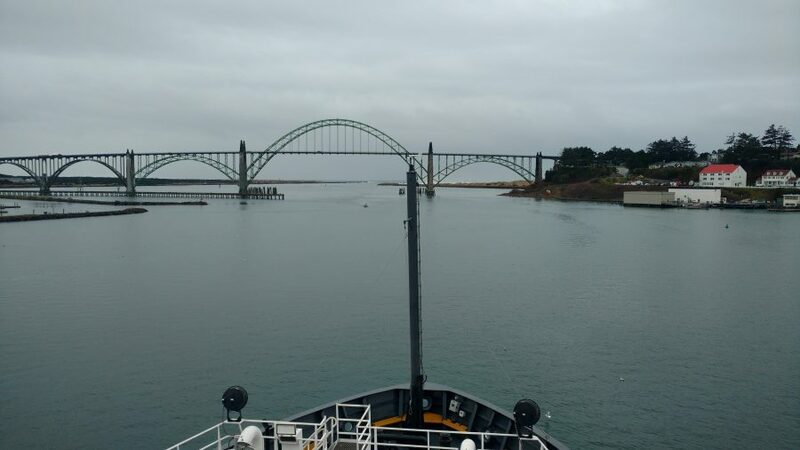 Eight years later, I am happy to report that I have just spent the last week as the marine mammal observer on the North California Current Survey on the Dyson’s sister ship, the R/V Bell M. Shimada. While we may not have seen as many marine mammals as I would have liked, the experience has still been everything younger Florence hoped it would be. If you’ve ever wondered why the scientists in your life may refer to summer as “field work season”, it’s because attempting to do research outside in the winter is an exercise in frustration, troubleshooting, and flexibility. Case in point; this cruise was supposed to sail away from port on the 24th of February, but did not end up leaving until the 27th due to bad weather. 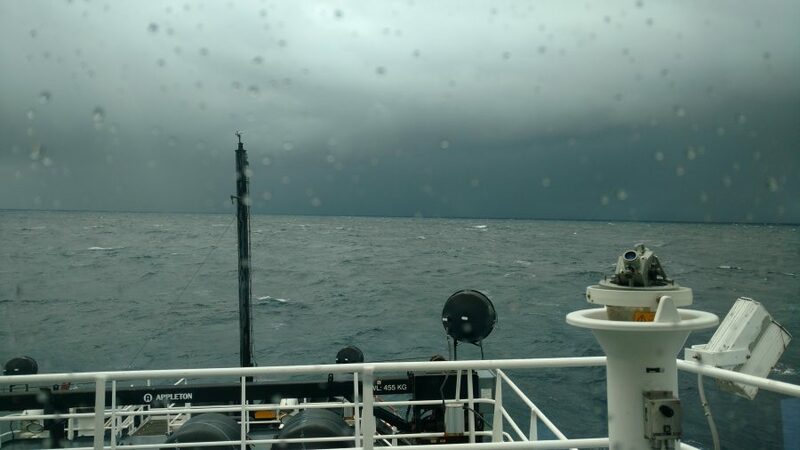 This weather delay meant that we had to cut some oceanographic stations we would like to have sampled, and even when we made it out of the harbor, the rough weather made it impossible to sample some of the stations we still had left on our map. That being said, we still got a lot of good work done! 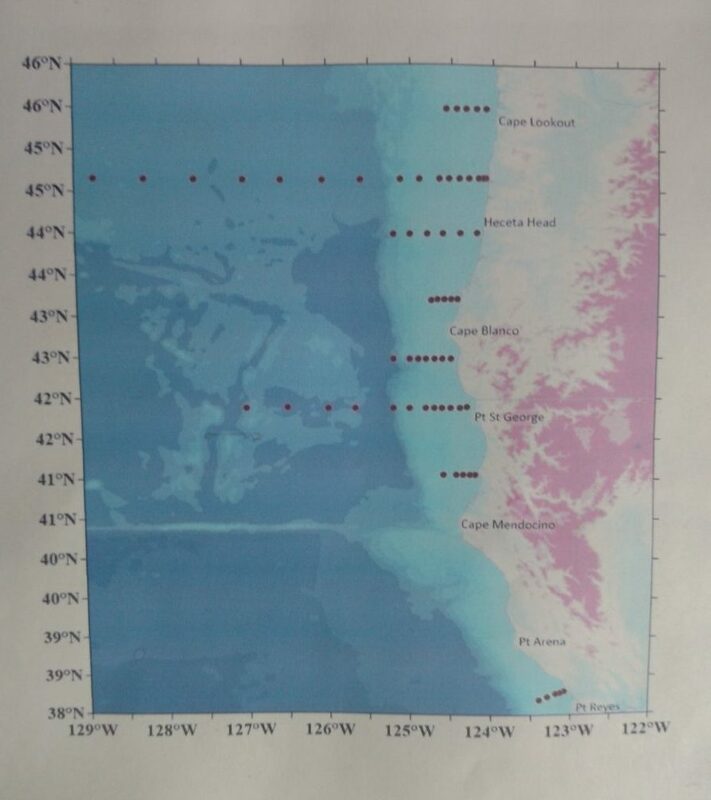 The oceanographers were able to conduct CTD casts at most planned stations, as well as sample the water column with a vertical zooplankton net, a HAB net (for looking for the organisms that cause Harmful Algal Blooms), and a Bongo Net (a net that specializes in getting horizontal samples of the water column). When it wasn’t too windy, they were also able to sample with the Manta net (a net specialized for surface sampling – it looks like a manta ray’s mouth) and at certain near-shore stations they did manage to get some bottom beam trawls in to look at the benthic community of fishes and invertebrates. All this was done while dodging multitudes of crab pots and storm fronts. The NOAA corps officers who drive the boat, and the deck crew who handle all the equipment deployments and retrievals really did their utmost to make sure we were able to work. For my part, I spent the hours between stations searching the wind-tossed waves for any sign of marine mammals. Over the course of the week, I saw a few Northern fur seals, half a dozen gray whales, and a couple of unidentified large cetaceans. When you think about the productivity of the North Pacific Ecosystem this may not seem like very much. But remember, it is late winter, and I do not have x-ray vision to see through the waves. 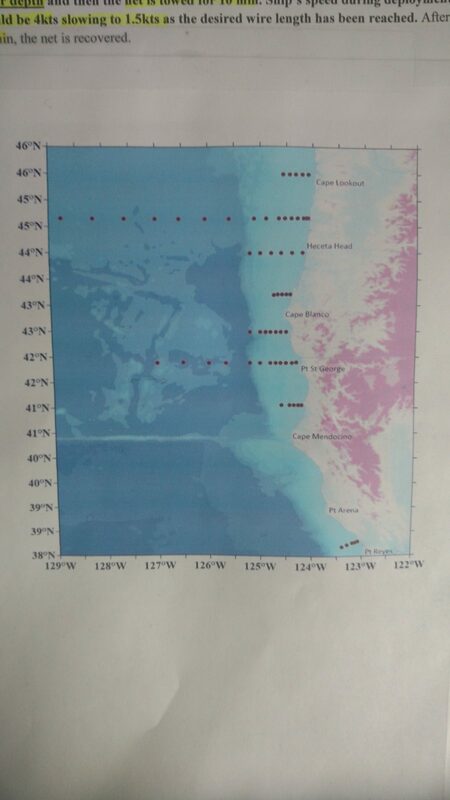 It is likely that I missed a number of animals simply because the swell was too large, and when we calculate our “detection probability” these weather factors will be taken into account. In addition, many of our local marine mammals are migrators who might be in warmer climates, or are off chasing different food sources at the moment. 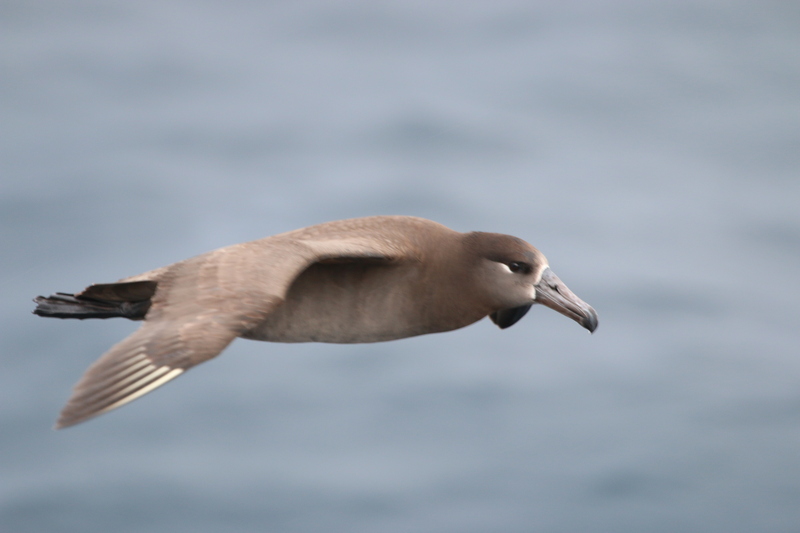 In ecology, when you want to know how a population of animals is distributed across a land- or sea-scape, it is just as important to understand where the animals are NOT as where they ARE. So all of this “empty” water was very important to survey simply because it helps us refine our understanding of where animals don’t want to be. When we know where animals AREN’T we can ask better questions about why they occur where they ARE. We sent these styrofoam cups down to 1800 meters depth. The pressure at those depths causes all the air to escape from the styrofoam, and it shrinks! 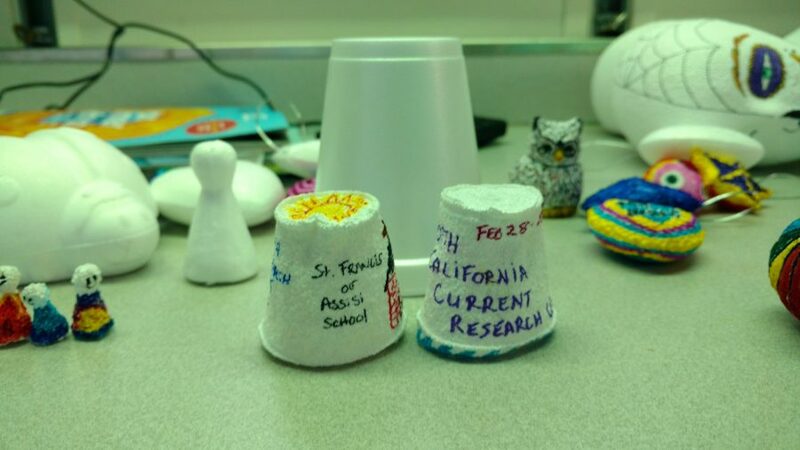 This is a favorite activity of oceanographers to demonstrate the effects on increased pressure! These sorts of interdisciplinary cruises are quite fun and informative to participate in because we can build a better picture of the ecosystem as a whole when we use a multitude of methods to explore it. This strength of cooperation makes me proud to add my little piece to the puzzle. As I move forward in life, whether I get to be the marine mammal observer, the oceanographer, or perhaps an educator, I will always be glad to contribute to collaborative research. Thank you for posting this. I am a mentor for the ASPIRE program at Central Linn HS in Halsey Oregon. As someone whose educational background is science and currently a marine mammal naturalist volunteer I had no idea one could have a career in this field. I will definitely share this. Thank you for reading! I am glad that the post was helpful. Happy you got that job. Glad to see you still get to work with marine mammals. Have already seen some of our summer feeders around Boiler Bay. Previous Previous post: How important are foundational, novel and review papers?